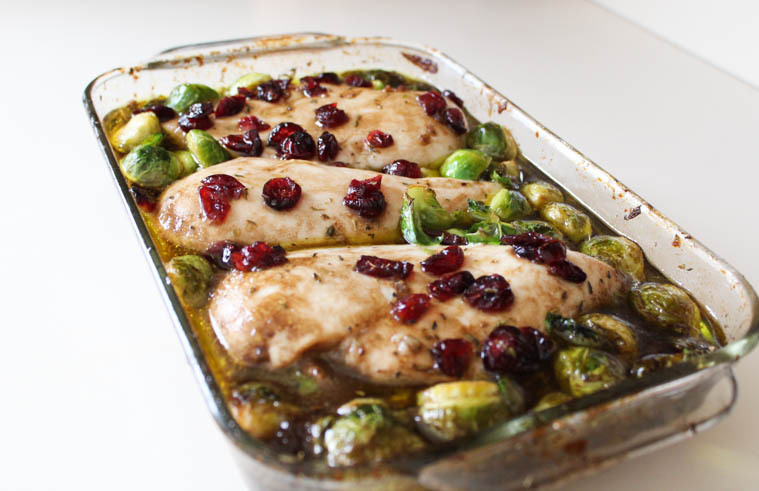 This freezer-friendly Cranberry Balsamic Baked Chicken recipe is healthy and simple, with a blow-your-mind-delicious balsamic marinade. 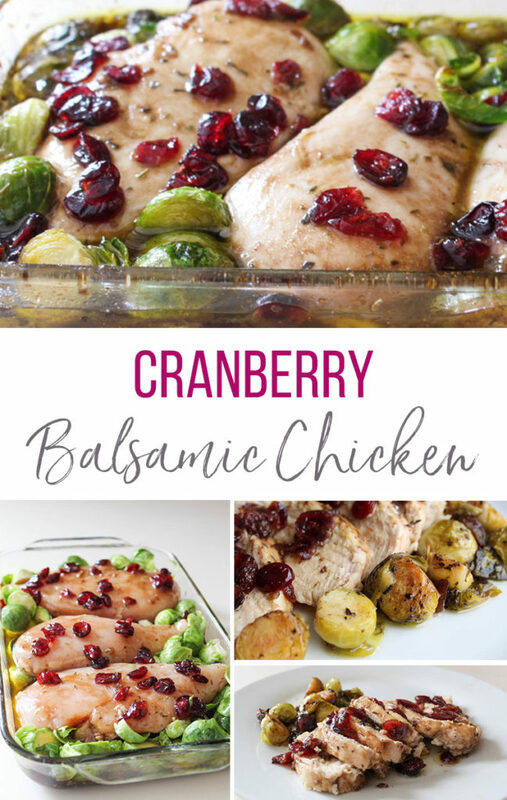 I was first introduced to this tasty, Cranberry Balsamic Baked Chicken recipe just a couple weeks after having my son, Jacob. After receiving some yummy but heavy pasta and casserole meals, which I gobbled gratefully, my mom made me this dish, and it was a like a breath of fresh air. Sitting in the balsamic marinade in the refrigerator all day, the chicken was incredibly tender and flavorful. Let me tell you, this marinade is everything. It’s tangy because of the balsamic and dried cranberries, and little bit sweet because of the maple syrup. My husband may or may not have caught me eating a spoonful of it out of the dish once. Just sayin’. He has no proof. Added bonus, since the chicken is best prepared ahead of time, you get to simply toss your dish in the oven at dinner time. 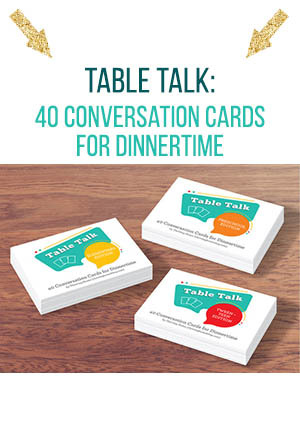 If you’re in the same parenting phase as I am, not having to be in the kitchen too long before dinner is a real game-changer. Not that I don’t love having my little people within a three feet proximity as me crying for crackers while I cook. It’s just not exactly relaxing. 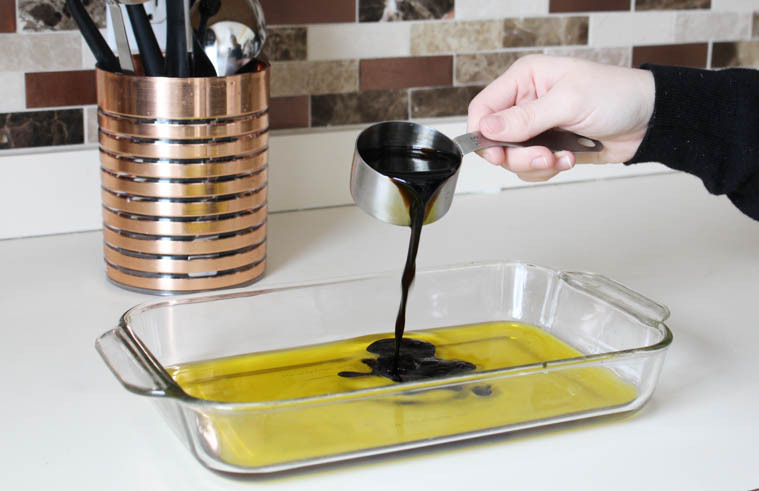 Start by grabbing a baking dish, or gallon size freezer bag if you’re planning on freezing, and whisk together your olive oil, balsamic, maple syrup, garlic, thyme, oregano, and salt and pepper. Then you throw in some dried cranberries. 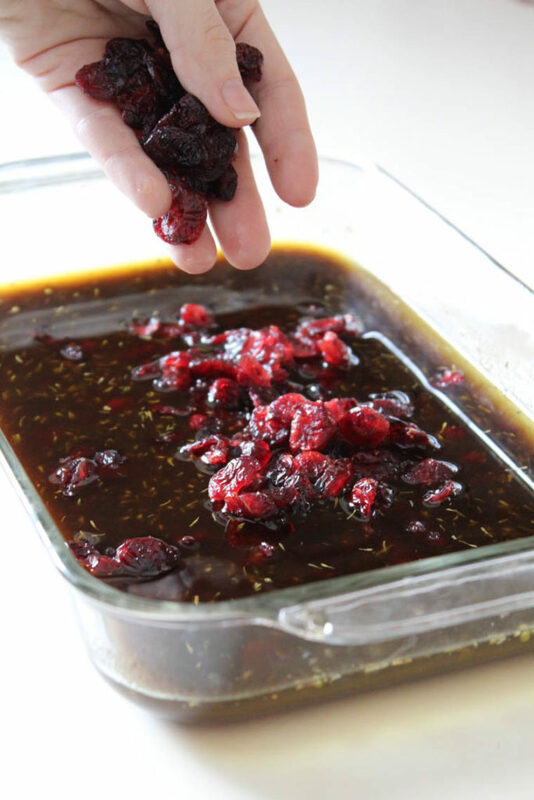 Those cranberries will break down in the balsamic vinegar and flavor the whole marinade. 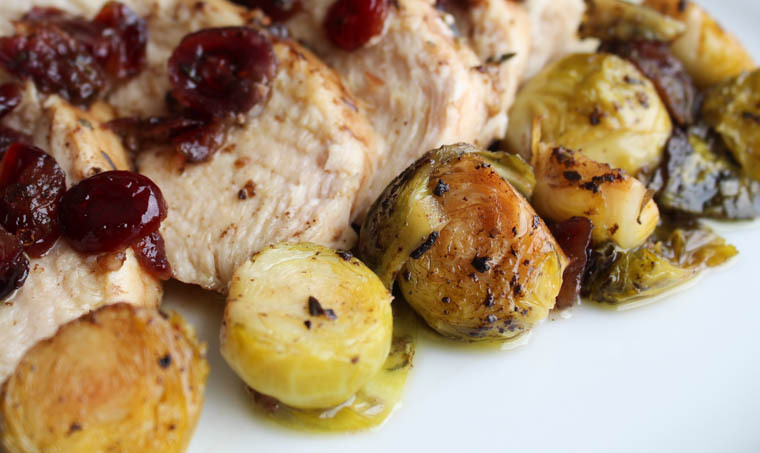 Add your chicken breasts and Brussels sprouts to the marinade, rolling everything around, and giving your chicken and sprouts a nice little marinade bath. Tuck it all in nicely, cover it, and let it hang out in the fridge for at least a few hours. After the marinade has worked its magic, pop this beauty in the oven and go sit on the couch and watch Ellen. You’ve done your job. The meal was such a hit that it became a regular in our dinner lineup. 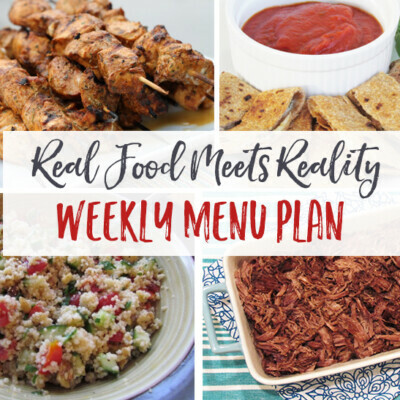 I was pleasantly surprised to find that it is as easy to prepare as it is tasty. 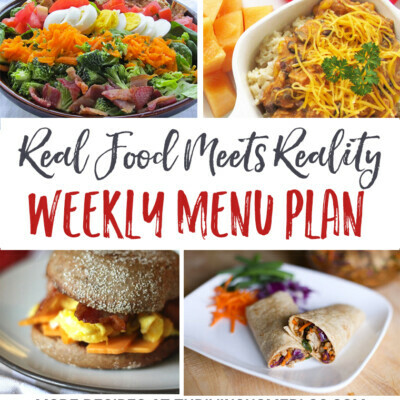 This dish checks all the boxes of being nutritious and simple, with a sauce so delicious you’ll want to eat it by the spoonful…but who would do that?! 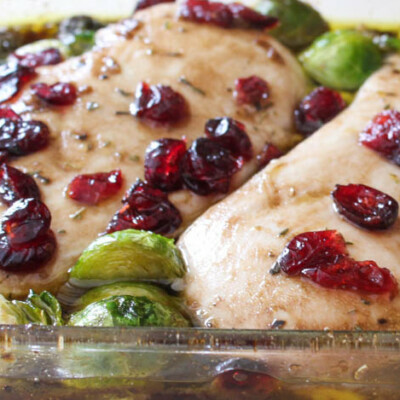 This Cranberry Balsamic Baked Chicken with Brussels sprouts is super simple to make and full of flavor. 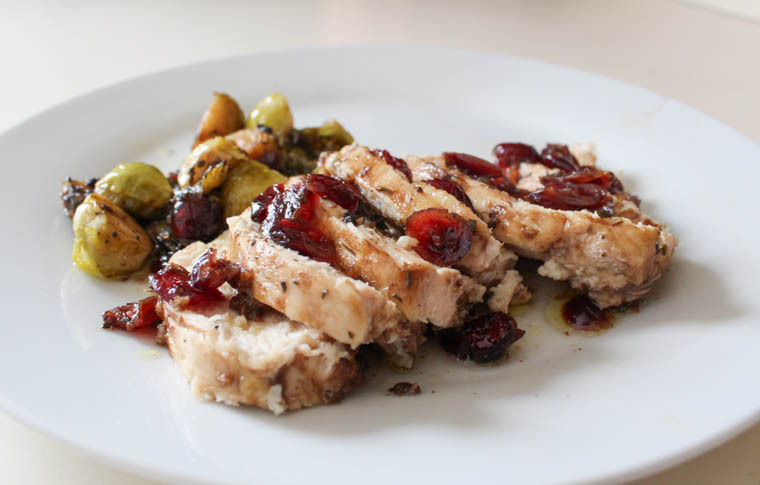 The delicious combination of the tangy balsamic with the sweet maple syrup and cranberries will make this chicken dish a family favorite. 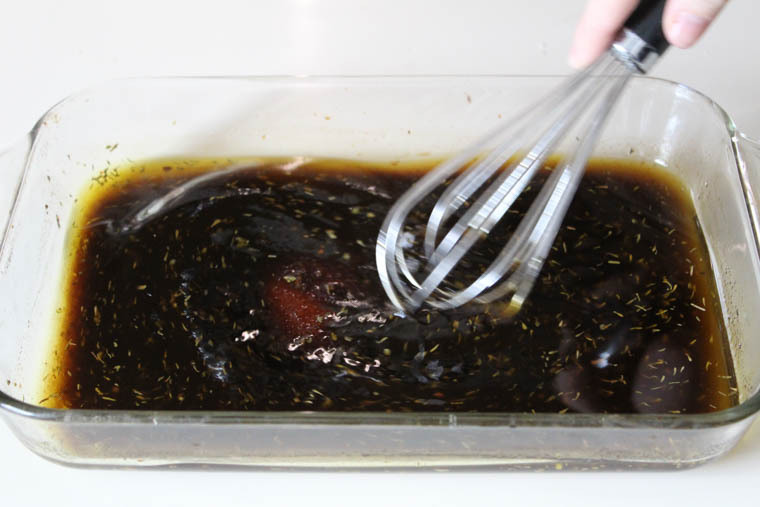 Whisk together oil, balsamic vinegar, maple syrup, garlic, oregano, thyme, salt and pepper in a baking dish. 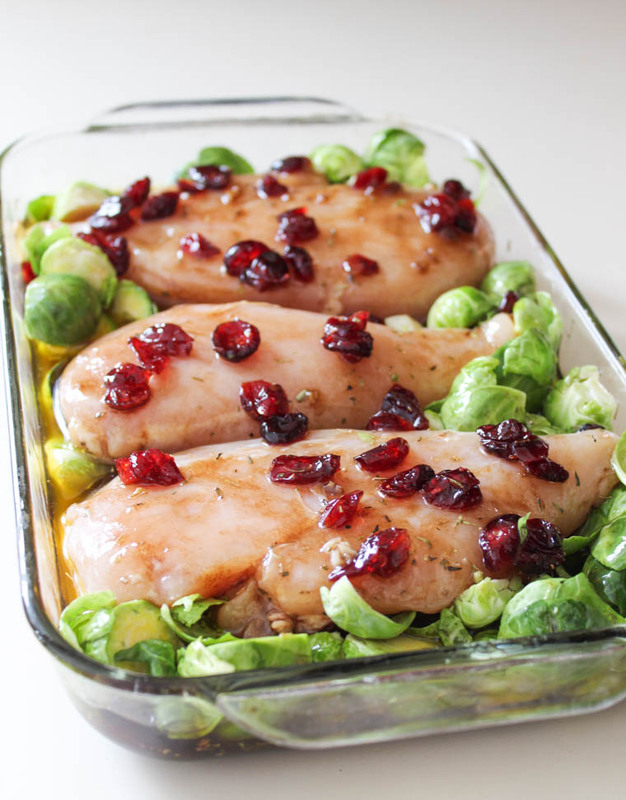 Add chicken, Brussels sprouts, and cranberries to marinade, and mix until everything is evenly coated. Cover dish and store in the refrigerator for a minimum of 4 hours. Bake uncovered at 375°F for 30 minutes. To Freeze: Complete recipe through Step 2. 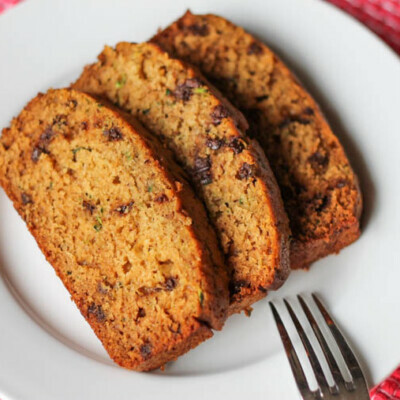 Pour all ingredients into a gallon-sized freezer bag or container with lid. Seal and freeze. 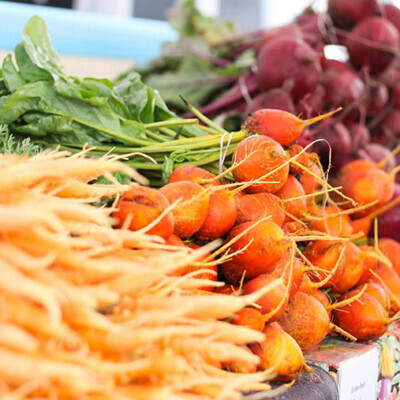 To Prepare from Frozen: Thaw for 24-48 hours in the refrigerator. Cook according to the instructions in Step 4. 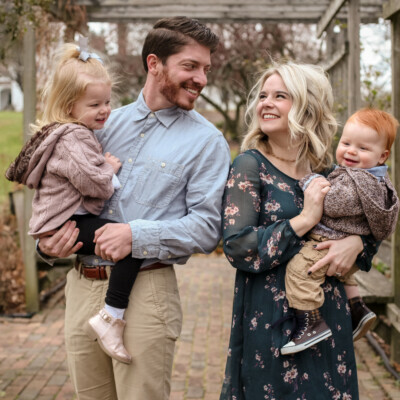 Alyssa is a former English teacher turned stay-at-home mama to a three year old little wildflower named Lucy, and one year old, Jacob, with fire-engine red hair. She married her high school sweetheart and still thinks he’s dreamy. 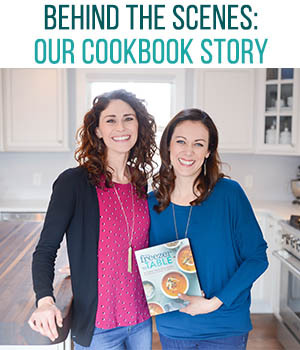 She likes to write about, talk about, make, and most importantly eat delicious, nourishing food. 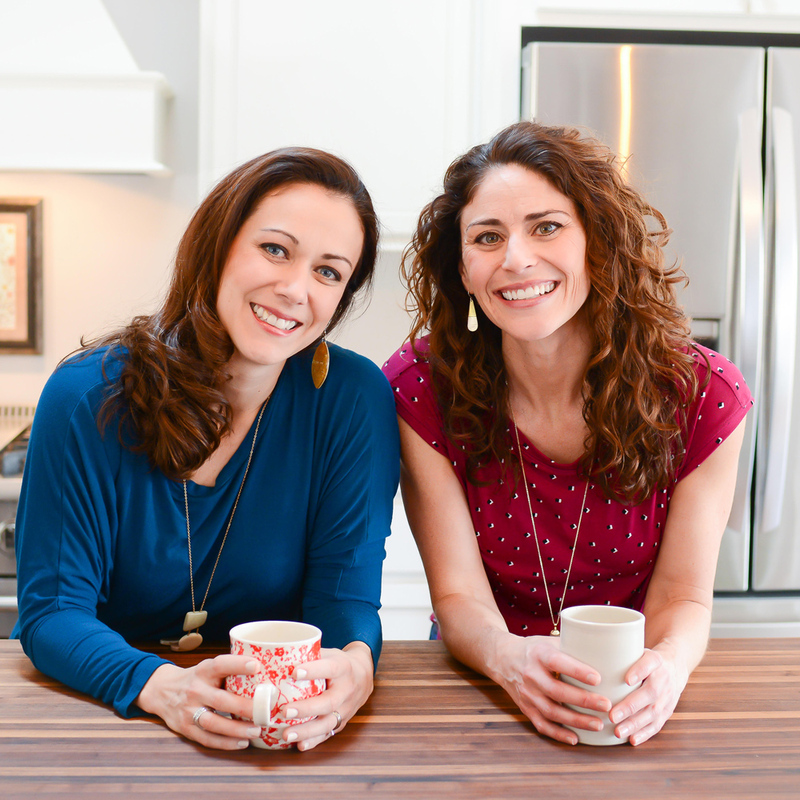 You can follow her journey at alwaysoverdressedbyalyssa.com where she passionately writes about her faith, family and parenting, mama style, and, of course, food. Love the combination of flavors here. How would I adjust the cooking time if I wanted to do this in a slow cooker? Thank you. Chicken breasts take 2.5-3.5 hours to cook in the slow cooker (they are done when they register 165°F internally). I haven’t tested Brussels sprouts in there, but I would imagine they would take about 3 hours or so (until tender). Hope that helps. Does this go in the oven still covered? Good question! You will bake this uncovered. I just updated the directions to make this clearer. Any suggestions for a substitute for brussel sprouts? Hmm, I’m not sure without test it. I just like to roast a big pan of veggies separately, usually. I just made this and substituted green beans for the brussel sprouts. It turned out great. Yum! Thanks for sharing about your swap. Sounds delicious, Diane. 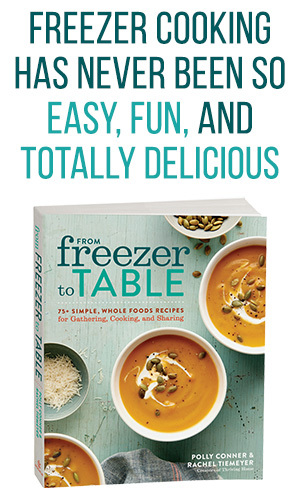 Have you tried using frozen brussels for this? I’m wanting it to be a freezer meal. No we haven’t, but sounds like an idea worth trying. 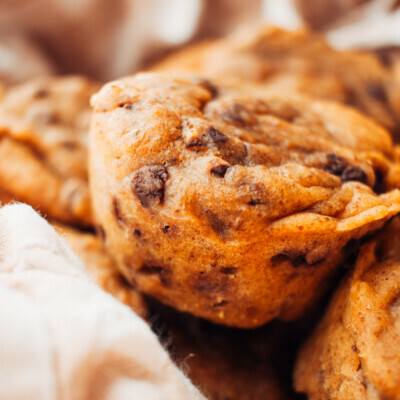 I tried this recipe last week, and it was such a hit in my house w/my husband and two boys. Thank you! Wonderful to hear that. Thanks for sharing, Tracy. Can you substitute fresh or frozen cranberries for dried? This is Alyssa’s recipe, but my thought is that dried cranberries have added sugar which cuts back the acidic taste that fresh cranberries are known for. I also think the fresh/frozen kind will contribute quite a bit of extra liquid. If you’re ok risking those two caveats, then go for it. Fresh cranberries would definitely be a healthier substitute.